A closer relationship between the International Olympic Committee (IOC) and IOC-recognised federations has been hailed following a successful workshop between the two, in which the IOC presented a "range of current projects and opportunities for greater engagement within the context of Olympic Agenda 2020". 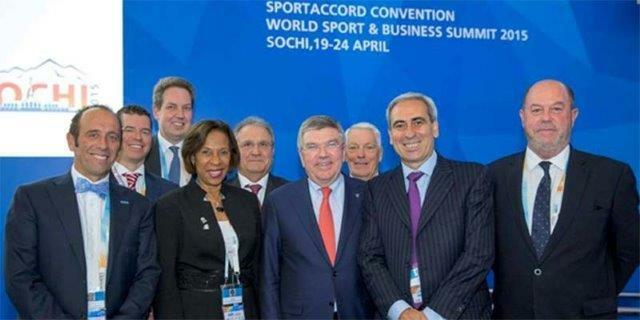 The timing of this announcement, which also saw the Association of IOC Recognised International Sport Federations (ARISF) reiterate how it wants to play a "key role" within the Olympic Movement, follows last week's SportAccord Convention in Sochi. SportAccord President Marius Vizer strongly criticised the IOC during the week-long meeting, as well as its President Thomas Bach and the Agenda 2020 reform agenda, which led to four Summer Olympic Federations resigning their membership. All except for Vizer's own International Judo Federation also signed a letter declaring opposition to the critical words. The spat put the non-Olympic Federations in a difficult position, however, as they almost had to choose between siding with the IOC or Vizer, the man who many of them supported in the 2013 election against IOC-backed opponent Bernard Lapasset who has sought to enhance their influence. In a statement last week ARISF made a "plea for unity" between the two bodies, but both the timing and the choice of words in the latest relaease suggests they are determined not to cause any rupture with the IOC. “I am fully satisfied with the outcomes of this first workshop and I am sure that this is a significant step towards a stronger relationship with the IOC and the Olympic Movement," insisted ARISF President Raffaele Chiulli. "We believe that ARISF and its member International Federations can play a key role within the Olympic Movement and we look forward to further working with the IOC on the implementation of the Olympic Agenda 2020 recommendations, which give opportunities and benefits for our Federations, our sports and our athletes." This week, Tokyo 2020 have also revealed that only IOC-recognised Federations, which are not already on the programme, will be considered when they analyse new sports to propose for inclusion, thus providing further impetus for ARISF members representing baseball/softball, squash, karate, surfing, roller sports and others. “The 35 IOC Recognised International Federations play a vital and highly valued role within the Olympic Movement," added IOC sports director Kit McConnell following the Workshop in Sochi. "We greatly appreciate our relationship with the Federations and Olympic Agenda 2020 provides the opportunity for greater engagement and an event stronger relationship. "Key opportunities include our athlete-focused programmes and the Olympic Channel and we look forward to building on the constructive and positive dialogue from the first joint workshop. "We equally look forward to repeating these workshops on an annual basis”.